HTC's VP of Product Management, Mo Versi, has sent out a tweet that updates us on the status of the Marshmallow update for the HTC One M9. The unlocked version of the manufacturer's current flagship phone will be updated to Android 6.0.1 this month, says the executive. 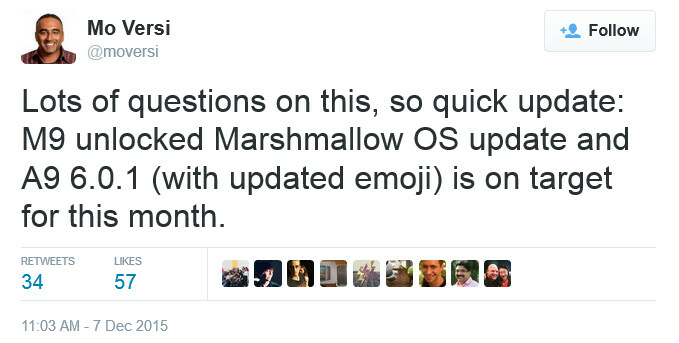 He also pointed out that this is the version of Marshmallow that comes with updated emoji. The tweet does say that there are "Lots of questions on this," which seems to indicate that this is not yet a done deal. The new version of Android includes power management feature Doze, which figures out when your phone is idol, and puts it in a deep sleep state in order to improve standby time. The update adds Google Now On Tap, which is a contextual search service that returns information based on what is on the screen. The new app permissions allow users to give approval to them on a feature-by-feature basis. The HTC One M9 is almost nine months old. The next HTC flagship could be called the O2. The handset is rumored to be equipped with a 6-inch screen with a 1440 x 2560 QHD resolution, and be powered by the Snapdragon 820 chipset. The latter would carry a quad-core CPU and the Adreno 530 GPU. Awesome news for HTC fans! Still one of the most beautiful phones on the planet. This update is probably the most pointless update of Android ever. The HTC One M9 was like a different phone after the latest 5.1 update (especially the camera) and I'm sure the 6.0 update will push things further along. I think if HTC waited to release the M9 until it got the software/firmware right the reviews and subsequent sales would have been much different. Unfortunately it's marred by the SD810 and a pretty awful camera. You can't fix that with a software update. They were so close to a damn near perfect phone. You have no idea! Just going with what the herd says. It does sound like 6.0 is headed to the M9, and only A9 will get the new emoji this month. Read it again. 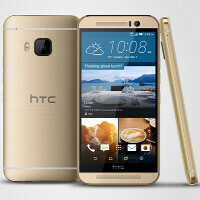 tanks htc ...but my wife have m9 and my phone m9+ ....not yet ?